Cook bacon until crispy on stove top. Remove from the pan and drain on paper towels. Add the garlic and cook until just starting to brown. Add the mushrooms and cook about 2 minutes until tender. Remove from the stove and fold in blue cheese. Salt and pepper and keep warm, but not hot. Heat a grill until very hot and you can hold your hand over the grill for not more than 3 seconds. Season with salt and black pepper. 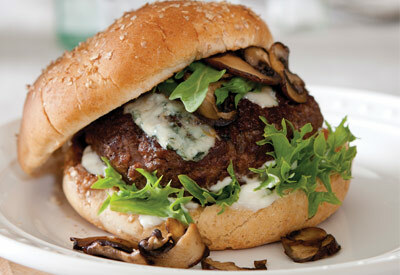 Place the burgers on the grill and cook about 4 minutes per-side (or until internal temperature reaches 160 degrees F). Remove from the grill and top with mushroom mixture. Serve warm on toasted buns. Save $2.00 on ONE Tide Purclean (excludes Tide Detergent, Tide PODS, Tide Rescue, Tide Simply, Tide Simply PODS, and trial/travel size).